Welcome back, dolls, and a very happy new year to you! 2010 was a great year and we're excited to see what 2011 has in store for us. So far, we were lucky enough to get over 2 feet of snow and can foresee some wonderful skiing and snowboarding fun in our near future. Although we can hit those blue trails like champs, we agree that one of the best parts about a long day skiing or snowboarding is coming home, changing into something super warm and comfy, and drinking cocoa by the fireplace. While we personally wouldn't wear alpine sweaters every day, they are perfect for winter activities. If you plan on taking a ski-cation, we'd suggest packing a few of these babies, or else you'll end up getting ripped off at the gift shop after you see how cute everyone looks in their Fair Isle getup! Whether you're skiing in the Alps of shoveling snow in the suburbs, cozy up in front of the fireplace in this thick, turtleneck sweater from Victoria's Secret. The red and white make it look especially Swiss, and we guarantee that you'll be craving some fondue in no time! 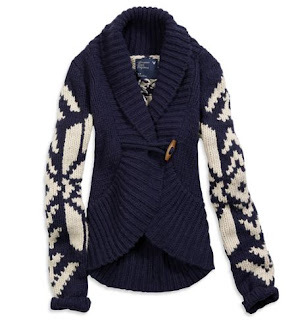 Another look straight off the ski slopes is this toggle sweater from American Eagle. We love that it's a cardigan, because you can always layer up and make it more casual by adding a graphic tee shirt underneath. It comes in a number of different colors, so get your crew together and hit the slopes! 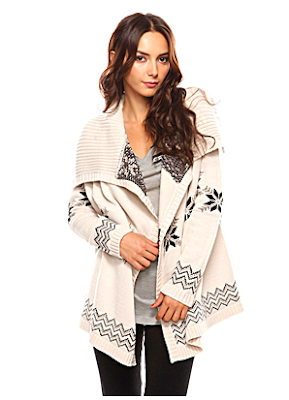 For all you snow bunnies out there, bundle up in this wrap snowflake sweater from Forever 21. If you're dreaming of powder fresh snow, we hear that wearing snowflakes the night before increases the chance of snowfall by 8.2%. It's all a numbers game, really. So we're thinking, if you wear this sweater, put on your pajamas inside out, and spin around three times, odds are that you'll have perfect ski conditions come morning. If you're a tree hugging snow bunny, then you'll love this wool cardigan from Free People. It has a large collar, big buttons, and a cute alpine pattern which is great for any après-ski party. We think this would look particularly cute with a vintage tee underneath (kelly green is always our favorite color choice), Utilitarian boots, and a Peruvian style beanie. We'll admit, when we think snowfall and skiing, we don't think poncho. But with a snowflake pattern and roomy hood, this poncho is perfect for the frigid winter cold. We love that you can layer up underneath and just drape it over whatever you're planning on wearing for the evening. 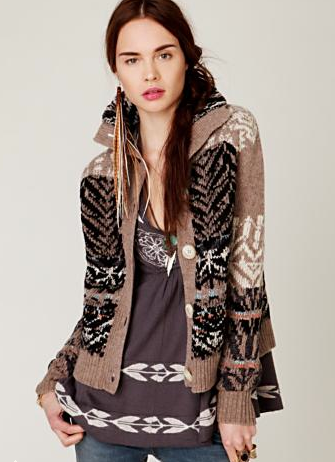 If you plan on attending a more sophisticated après-ski bash, you may want to go for this Fair Isle sweater dress available at Macy's. 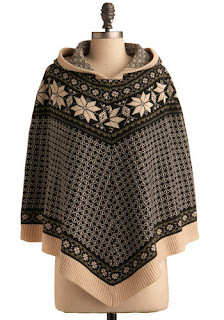 It's a little more posh than the big bulky sweaters shown above, but it'll still keep you cozy warm in the cold winter nights. You can dress it up with tights and flats, make it look funky with leggings and fringed boots, or go comfy with jeans and Uggs. Let's hit the slopes, dolls! Love these sweaters, esp. the last. I love the second sweater! The Forever 21 sweater makes me think of a fun experience Jess Lane and I had walking back to our car from Warped Tour one year, haha.